MS Economics students Di Wang and Kristopher Cramer spent their summers completing the prestigious American Institute for Economic Research (AIER) Summer Fellowship Practicum Program. The Practicum focuses on enhancing Fellows’ understanding of economic concepts, theories and real-world applications, and provides an opportunity to develop research, writing and presentation skills. The students work closely with the faculty of the program during their seven-week stay in the Massachusetts-based facility. Wang’s project focused on building a portfolio rebalancing model for the investment advisors who work for Portfolio Advisor Services – a for-profit subsidiary of AIER. He focused on determining an optimal strategy — balancing frequency, risk, co-efficient models and threshold/rebalance for a fund worth $700M. His project required a lot of review of research literature, in both economics and education. He also looked at examples of how economics is taught globally. Cramer hopes to work in the public sector at some point, and plans to earn a PhD in economics. Established in 1933, the American Institute for Economic Research is well known for its Everyday Price Index (EPI), which includes the price of food, gasoline, utilities and personal care products and is an extension of a subset of the more commonly used Consumer Price Index (CPI). This program is ranked among the top 10 summer fellowships available for graduate students, this program allows students and recent graduates to work in an economic research-based environment per the Institute’s mission. 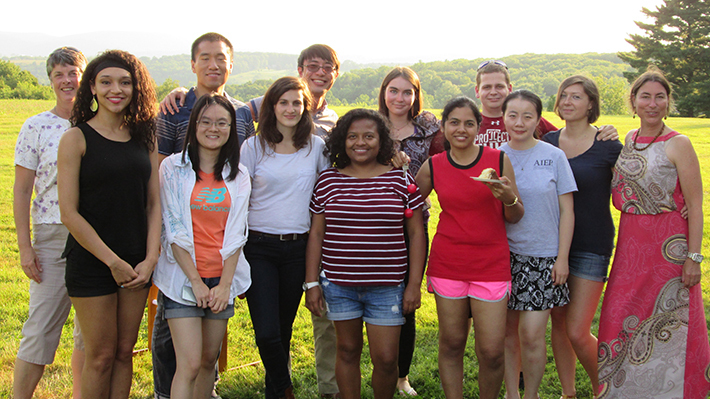 Photo: The AIER 2015 Summer Fellows. Wang and Cramer appear third and fifth in the back row, respectively.